Parts of the East Coast are finally adopting solar energy projects, and New York City is leading the charge. 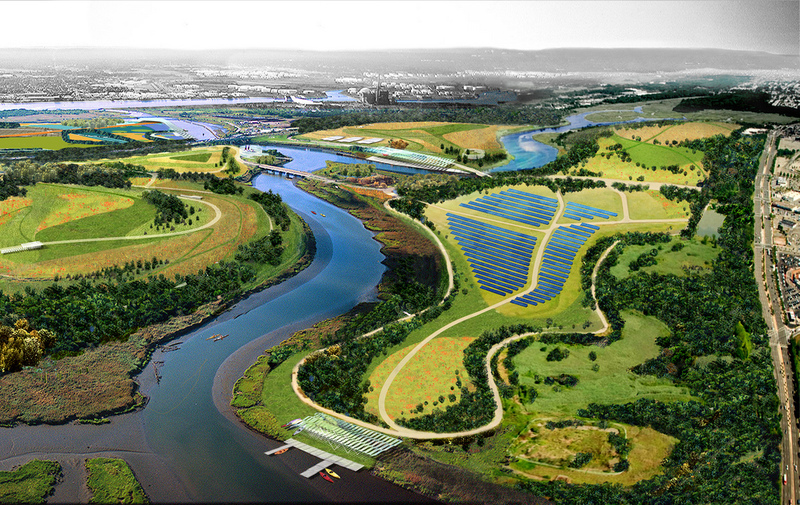 Staten Island's Fresh Kills Park - on the site of what is currently the world's largest landfill - will soon be the largest solar energy facility in the city. Once finished, the 47-acre plant, which will be leased to SunEdison, will consist of 35,000 solar panels and produce up to 10 megawatts of power - enough to energize about 2,000 homes. The plan was announced Nov. 25 by Mayor Michael Bloomberg, Parks Commissioner Veronica White, Sanitation Commissioner John Doherty, and Director of Long-Term Planning and Stability Sergej Mahnovski. "Soon Fresh Kills will be the site of the largest solar power installation ever developed within the five boroughs," Bloomberg said. "Thanks to the agreement today, we will increase the amount of solar energy produced in New York City by 50 percent, and it is only fitting that Fresh Kills, once a daily dumping ground, will become a showcase for urban renewal and sustainability." "Daily dumping ground" would be putting it lightly. For 55 years, the Fresh Kills Landfill, which was so enormous it could actually be seen from space, received thousands of tons of New York's garbage, as described in a 2001 report in the Staten Island Advance. In the late 1940s, some New Yorkers formed the Staten Island Anti-Garbage Organization and led protests against the landfill, but to no avail. And the advocacy group Staten Island Citizens for Clean Air (SICCA), which formed in the 1980s, tried and failed to reduce the amount of trash being accumulated there. Barbara Warren, secretary of SICCA, told the Advance, "To be honest, in the beginning people didn't know how bad it was. But everyone complained about Fresh Kills. It was a nuisance. And it had no permits, and was in complete violation of every environmental law. We didn't even know that until we went to state agencies and filed a Freedom of Information Act request and got all the data." Decades later, it seems the city is finally taking measures to improve health and make a push for renewable energy. It's worth noting that the states of New York and New Jersey share a reputation for having high pollution and numerous toxic waste sites. New York has 86 areas declared Superfund sites by the EPA, to boot, while the ironically-named Garden State has 113 - the most of any state in the country. To many, this could also be an indication that New York City, which saw its infrastructure take a heavy beating after Hurricane Sandy, is finally learning its lesson and upgrading to clean energy. If this new facility is a sign of more solar implementation to come, New York would be following in the footsteps of New Jersey, which last year was ranked as number one in the U.S. in solar energy. In New Jersey, 800 landfills and 10,000 abandoned industrial areas are currently being converted into massive solar farms, after the approval of a $446 million solar energy proposal by Jersey's Board of Public Utilities. Power company PSE&G is currently building solar farms in Kearny, Edison, Hamilton, Linden, and Hackensack. Meanwhile, the town of Garfield has opened a new Weatherization and Green Technology Training Center and entered into a 15-year contract with solar company Amberjack Energy to work toward making the town completely reliant on solar energy. For New York, the Fresh Kills development is seen as a major victory. Marcia Bystryn, president of the New York League of Conservation Voters, said, "Not long ago, few could have imagined that Fresh Kills would be transformed into a clean energy facility. This is one of the most exciting clean energy projects in development in the entire city, and it will serve as a powerful symbol of the environmental renaissance now under way on Staten Island." "Developing solar energy here shows that large-scale renewable energy projects are possible in New York City, but this is only a first step," said deputy mayor for operations Cas Holloway. "If we are serious about meeting New York City's tremendous energy needs from renewable resources, we need the state and federal governments to work with us to make solar and other renewable energies easier to develop, install, and access on the energy grid."